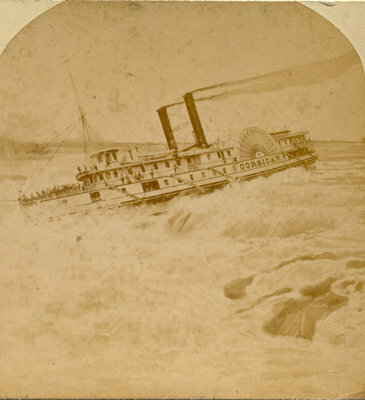 Stereoview of the Richelieu and Ontario Navigation Company steamboat CORSICAN in the Lachine Rapids near Montreal. The card has been trimmed from its original size to match the more popular shorter style, which is why the borders are not even. On reverse: W. Notman, Photographer to Her Majesty, Montreal 1876; Also at Toronto, Halifax, Ottawa, & St. John, N.B.